Mr Cohen, you Sir are quite correct. In my mind there is no finer game than cricket. I’m biased of course as I’ve grown up playing and watching the sport. It brings out the finest qualities in all who play. You need patience to play cricket, and you need humility. Cricket teaches you to be a good loser. It requires great mental strength and intense levels of concentration. A game of cricket can be a long, drawn out affair, and as such you are taken on a journey, broken only by a pause for tea and scones. Which other sport offers this?! I understand why many people are mystified by cricket. On first glance it appears to be a bunch of men, all dressed in white, stood around in a large field. Every so often they move. There are random cries, and hand clapping occurs even when it appears to be completely unwarranted. Two men wear white coats. They’re not doctors. They’re the umpires. You never argue with an umpire, even if they’ve just ruined your whole afternoon by raising their finger and giving you ’out’. Some wield a bat, others throw a ball. One man wears big gloves, the others don’t. It’s also perfectly legitimate to shout the terms ‘silly mid on’, ‘long off’, ‘googly’, ‘square leg’, and ‘Howzat!’ on a cricket pitch. However, the intricacies of the game are what make it so special. It takes years to learn the vast book of rules, and I’m not sure you ever really master them all. Occasionally you think you have and then something happens during a match (i.e. a stray badger interferes with play or a mistimed sneeze causes chaos) and you end up desperately searching for a solution. In February 2009 I left the UK, and after a short plane ride found myself sipping beer, eating sausages with mustard, and embarking on the early stages of this teaching journey in the wonderful city of Prague. My cricket bat was left tucked away in my garage at home. I envisaged Prague enforcing a prolonged break from the game I love. I was wrong. A quick search on the internet soon quashed those fears, and before I knew it I was bowling in the nets with a group of other Prague expats, mostly from South Asia. One weekend we even drove across the Czech-German border and played a quick game in Dresden against another group of South Asian German expats. Although on this occasion the break didn’t consist of tea or scones. Someone ordered pizza. In Rwanda, I once again envisaged forced cricket abstinence. In this former Belgian colony, cricket was never going to be a favourite pastime. 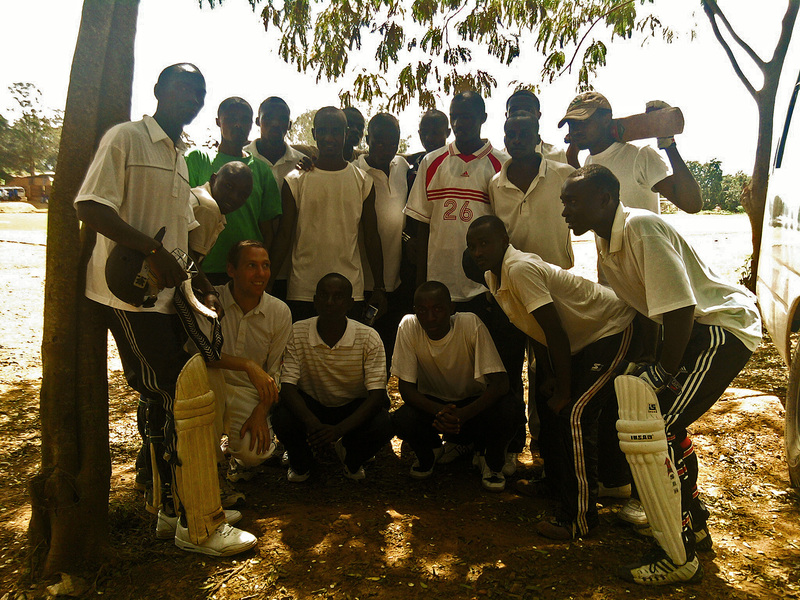 However, a chance meeting with a Ugandan guy early on in my time there put me in touch with a small, but dedicated group of cricket lovers, which enabled me to get my regular fix. It even led to the bizarre scenario of coaching the President’s son on one occasion. He had a good eye; a future batsmen perhaps. However, before departing for Bangladesh I had very different expectations. 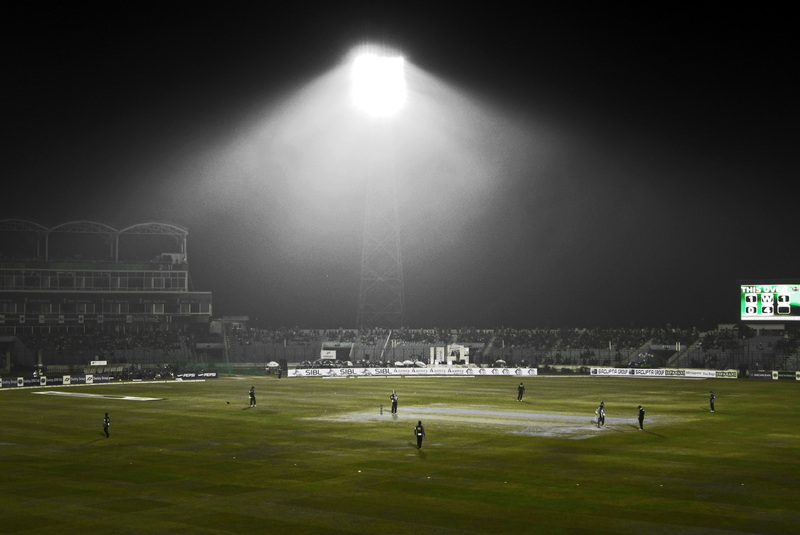 With Prague and Rwanda I’d prepared myself for cricket solitude. Bangladesh would be different though. 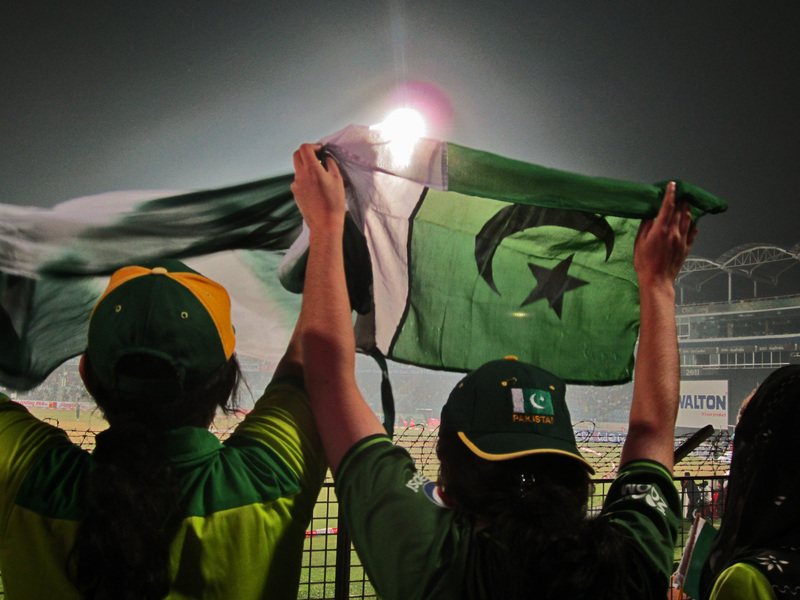 A nation with a strong history of cricket lovers gave me firm hope that my passion would be shared with others. I haven’t as yet been disappointed. The words “amar cricket bhalo lage” have generally been well received. In Kulshimart (my local supermarket) I’ve formed good relations with some of the guys who work there. Our discussions are never very deep due to my poor Bangla, but often we end up listing our favourite players, or vaguely discussing recent results. For me though it goes beyond cricket. 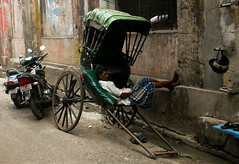 One thing I’ve noticed about Bangladesh is the rigid roles in society. For example, if your job is to serve, whether that be as a cleaner, or a rickshawallah, or a shop worker, that’s exactly what you do. You serve, you don’t (from my observations) engage with the person you’re serving in any meaningful manner. You serve them, you’re their servant. This is just my experience though, and I could very well be wrong. My point is that as we’ve chatted about cricket, my interactions with the Kulshimart guys have become far more relaxed, and it has broken down the almost fabricated hierarchical structure that made me (and perhaps them) a little uncomfortable before. Nevertheless, the opportunities for cricket here are still plentiful if you look for them, and recently I’ve enjoyed some really positive experiences involving the game. 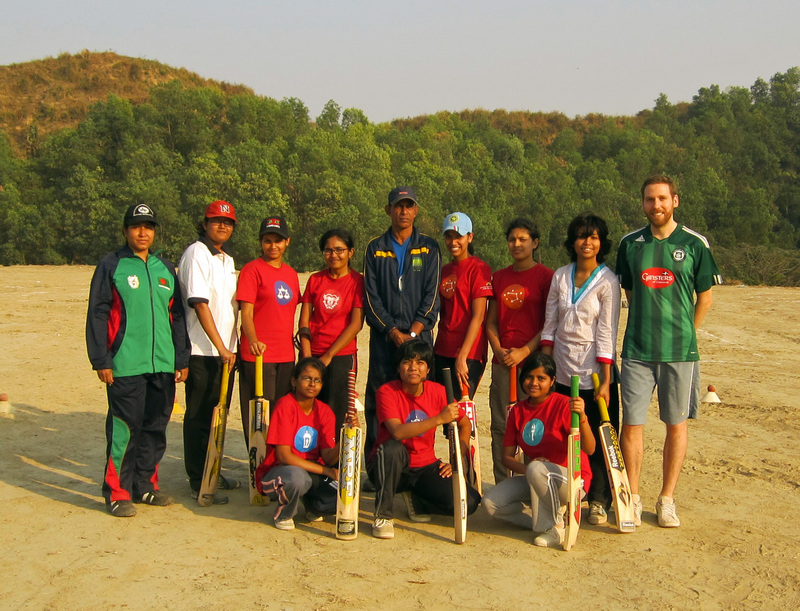 Towards the end of the last academic year I took on the challenge of starting a cricket club here at AUW. It was generally well received and attendance was surprisingly good. At the beginning of this new academic year we were also lucky enough to recruit a proper cricket coach. Tapan, a local to Chittagong, has vast experience in both playing and coaching the game, so he’s a real asset…and a character! His motivation techniques are interesting to say the least. Resembling a sergeant major on occasions, his favourite tactic for getting students to work harder is by either a) barking orders at them, or b) pretending to throw a ball at them. They respond hurriedly to both! No, in all seriousness Tapan is a popular coach and the students enjoy his dry sense of humour. It’s also been a great opportunity for me to learn some of his methods in case I continue coaching in the future. Well Len, I hate to break it to you, but men knit now too you know. When I ask the AUW students who attend cricket club if they’ve played before, most of them have the same answer. “No, but we used to watch our brothers play a lot when we were younger.” So for many students this is the first opportunity they’ve had to actually play the game rather than simply watching their male friends and relatives enjoy the sport. 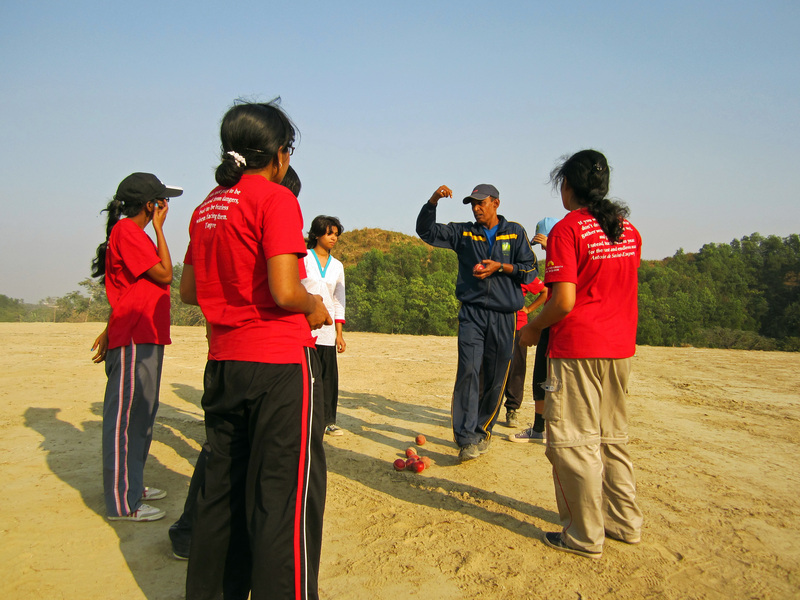 The aim is to produce an AUW cricket team who will one day take on women’s’ teams across the country. They’re fast learners, so hopefully this won’t be a distant dream. 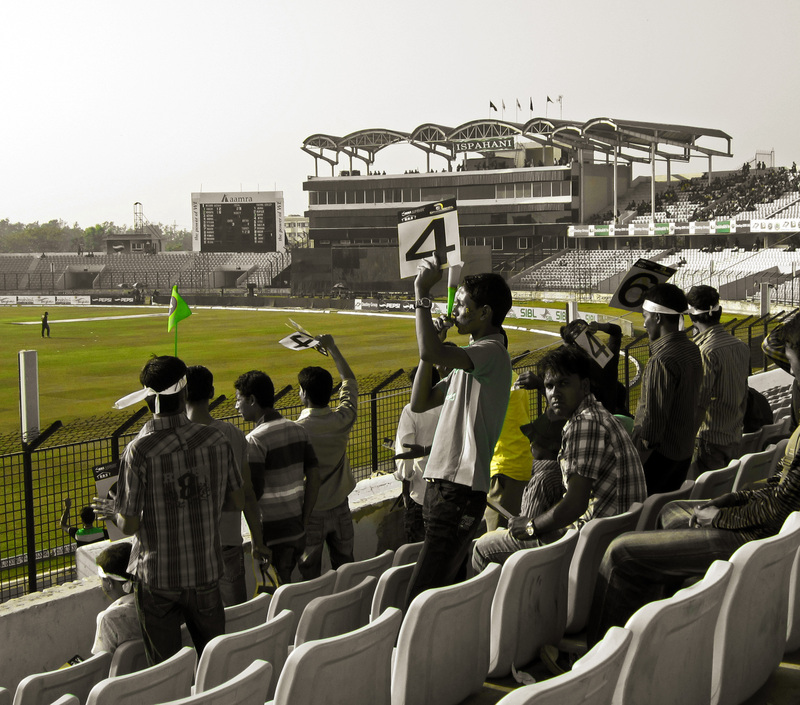 Live cricket is not uncommon here in Chittagong, but it’s often hard to track down. Events are generally not so well publicised. However, back in December my students made sure I knew about one upcoming match; a one day international between Bangladesh and Pakistan. A mouth-watering fixture because of the importance of the actual cricket of course, but also the history between the two nations. Anyway, it was ‘decided’ by one of my class groups that I would take them. This eventually led to the whole university being invited! Ultimately we ended up with a coach full of around 50 students and 15 faculty members. Organising such a trip was a little stressful due to the logistics. However, the real fun started upon reaching the stadium. 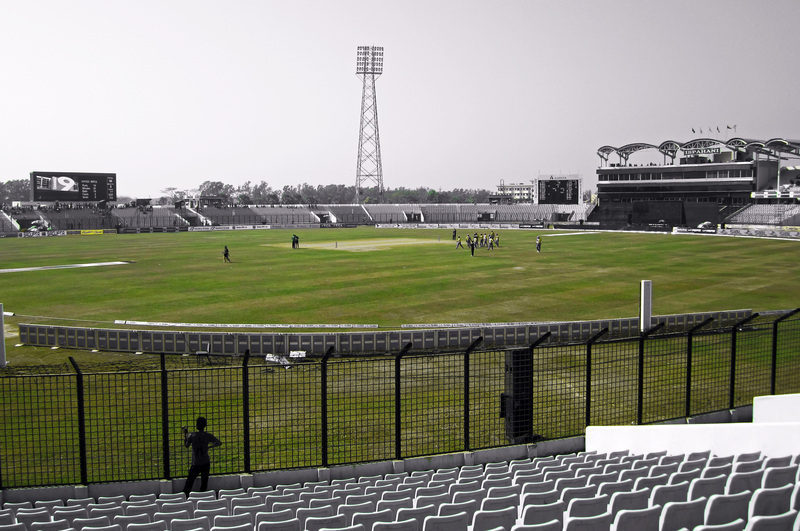 Live cricket in Bangladesh is generally a male pastime. You’ll see the odd woman, but overall it’s a stadium full of testosterone. 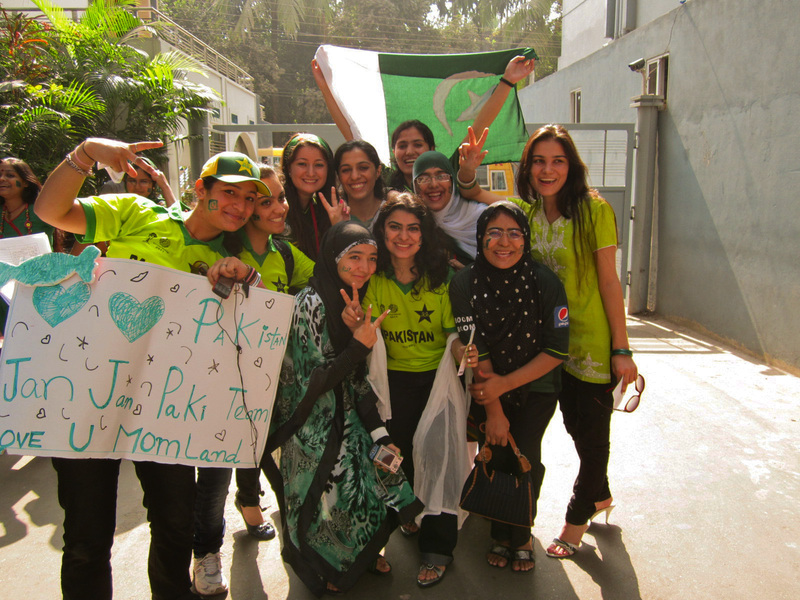 You can imagine the surprise and intrigue then as we shuffled into the stadium; 50 young women – some waving Bangladeshi flags, others waving the green and white of Pakistan. 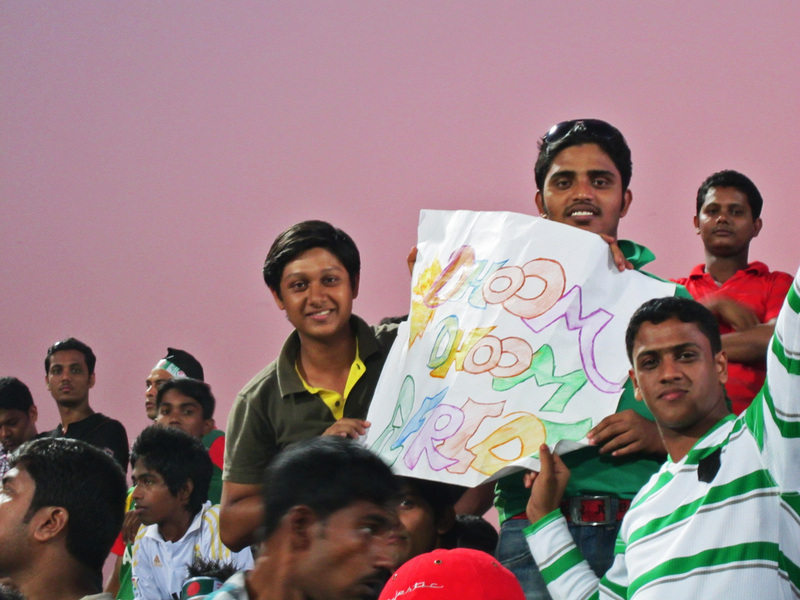 We also then had some interested Sri Lankans who’d come along to see their national sport in action too. It made for an interesting afternoon as men crowded around our group, anxious to know where we were from and what we were doing there. In general it was a fun day out and great for the students. For me personally it wasn’t so relaxing. Having coordinated the outing, it was generally my responsibility to ensure all students who got off the coach made it back on to the coach unscathed at the end. It got a bit hairy at the end as crowds pushed and shoved to leave the stadium, but by 10.30pm all students were back on campus. I was back at the stadium with a friend of mine last week. 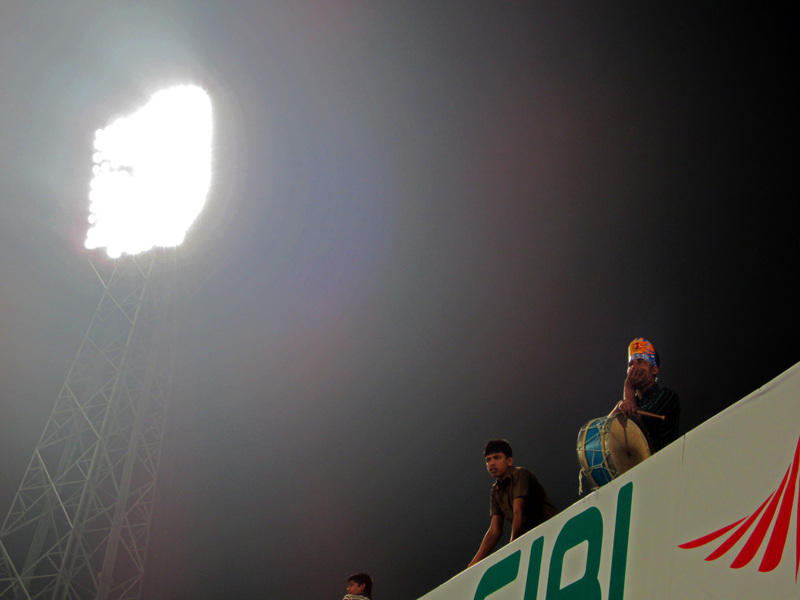 Jumon, a sports coach and avid cricket fan got us tickets for the Bangladeshi Premier League (BPL) fixture in Chittagong. It was another good day out as the BPL has attracted some big names. For any non-cricket fans this information won’t mean much, but players such as Chris Gayle (West Indies), Herschelle Gibbs (South Africa), Brad Hodge (Australia), Peter Trego (England), Scott Styris (New Zealand), Shahid Afridi (Pakistan), and Shivnarine Chanderpaul (West Indies) have landed in Bangladesh for this tournament. Many of these names are international stars, so it’s a coup for Bangladeshi cricket. Watching live cricket here in Chittagong hasn’t been quite the same as back home. In the UK I’ll go and watch Somerset, my local county team play on occasions, and the fun is as much about a nice pint of cider or real ale and a bacon sandwich as it is the cricket. There’s something very English about live cricket back home. Crowds of people concealed under sunhats, their faces discoloured with a thick layer of sunscreen. They sit reading the newspaper, occasionally peering over their glasses to see a rasping cover drive by the batsman. There’s a polite ripple of applause and once adequate acknowledgment has been duly offered to the batsman, they return to their crossword. 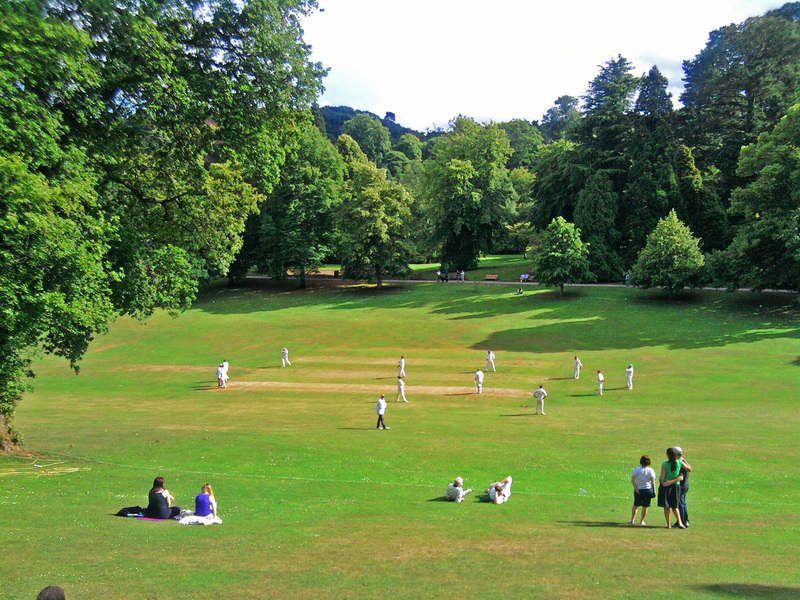 Lunch breaks are characterised by picnics and flasks of tea, and during the day bottles of wine ease spectators into a relaxed state of cricket merriment. However, the crowds here in Bangladesh possess their very own charm, and the viewing experience is in complete contrast to back home (no alcohol for a start). The energy and zeal towards the whole experience is striking. 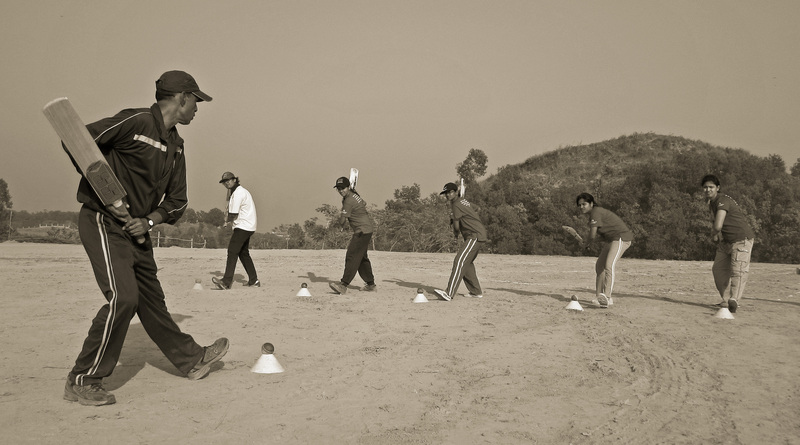 The passion for cricket is remarkable, and it’s possible to argue that cricket goes beyond the role of just a game. 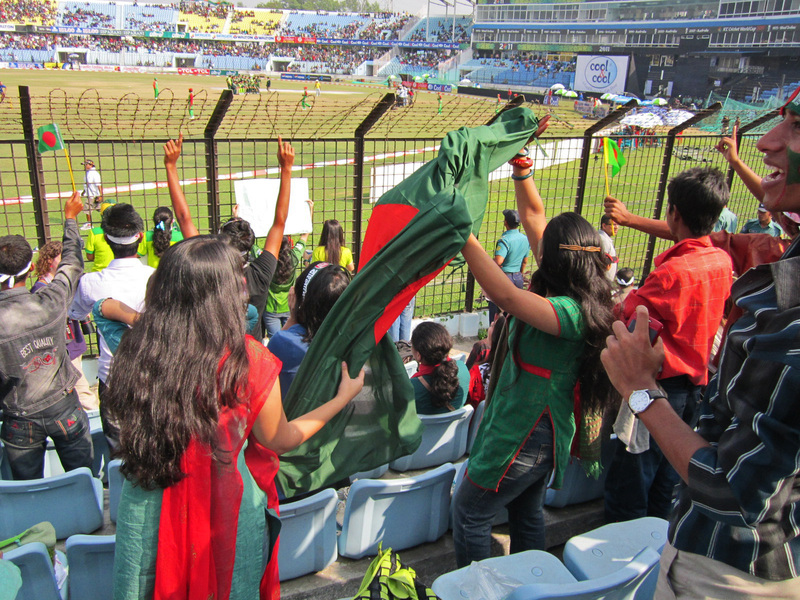 I hope one day Bangladeshi cricket fans will have the opportunities and facilities they deserve. 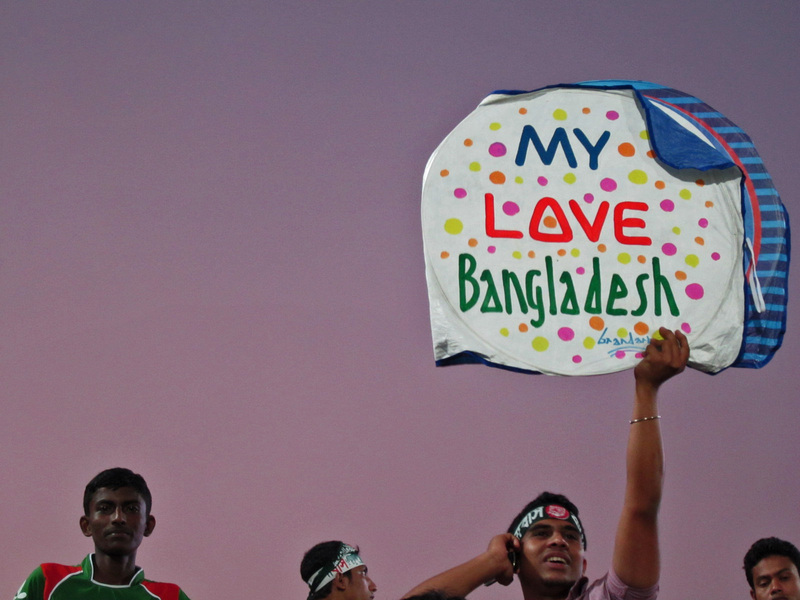 If they do, the rest of the cricketing world better watch out as Bangladesh will be a force to be reckoned with. I’ll finish with a cricket anecdote of mine. It’s also in fond memory of my Auntie Freda (well, Great Aunt) who sadly passed away very recently. Auntie Freda was a cricket fan too. She often enjoyed watching the test match on television. When my Dad (her nephew) was growing up she’d take him to watch cricket as he was mad about the sport. Anyway, a few years back my cricket club (Cockington Corinthians C.C.) went on a short tour, playing against teams in the Gloucestershire area of the UK. On the way back we arranged a game against Winsley Cricket Club (the village where my Auntie Freda and Uncle Frank lived). They were both very excited about coming to watch, especially as both my Dad and I would be playing. It was a beautiful day and a really enjoyable game of cricket. However, eventually the moment came when I had to bat. I walked out onto the pitch; a nervous fourteen year old, with the added pressure of family members watching. I took guard and waited for the first ball to be bowled. I’d like to say that the bowler was a 6’5 giant, who could deliver the ball at 90mph: However, he wasn’t. He was smaller, skinnier, and younger than I. Nevertheless, he tossed the ball up, and I could see it spinning through the air. I stepped back and tried to get my bat on the ball, but inevitably missed. It hit my pads and the scream of “HOWZAT” went up. I looked up and in my head all I could think was “no, no, no.” The umpire stared for a moment, and then raised his finger. I was out. My game was over. I trudged back to the pavilion where my expectant family were waiting. Dejected and most probably fighting back a tear. There were a few remarks of “unlucky John,” or “don’t worry about it,” but Auntie Freda looked at me and exclaimed, “You’re not really a batsman are you John!” It was perfect timing! In my eyes, it certainly is. This entry was posted on March 1, 2012 by johnstanlake. It was filed under Uncategorized . Great stuff John! I never realized how delightful cricket is to watch – doing the crossword with a cup of tea is my kind of sport. Maybe I’ll see if the madness has made its way to San Francisco. Also wondering how you played for a team called “the Cockington Corinthians” and we never managed to work that into a nickname. I’m on it. John enjoy reading your articles and always go away feeling impressed by the things you are doing. Cricket is in our blood now a days,We just don’t like cricket,We fulfill our dream by cricket.Its our hope to win world.To expand our country to world community.So thanks to you because you are doing a great job ……….. Very interesting john. Jim Spooner has just given th Cockington pitch its first cut of the year this week! another seson soon with us. Great read as always John and nice you mentioned Auntie Freda & Uncle Frank. What gave you the impression I was cricket mad ? Keep the blogs coming and can you find a Bangladeshi pro for Cockington for the coming season ? Just came across your article while browsing aimlessly (actually, that’s not true – was searching for where I might be able to buy cricket accessories in Prague) and loved it, so couldn’t leave without sharing my appreciation for it. Very nicely put. Thanks very much! Really glad you enjoyed it. I’m guessing you’re a cricket fan?! If you live in Prague and need any cricket contacts just let me know.